As we all know, the UPTET 2018 Admit Card is now available to download (print) starting from 6 October 2018 onwards at official UPTET website. This time there are 3 download locations (servers) to download the UPTET 2018 Admit Card (Examination Hall Ticket). Out of the 3, the 1 location is for the primary level & 2 download location is for the upper primary level. Below are the Official UPTET 2018 admit card download links for both UPTET levels. UPTET 2018 Admit Card (Examination Hall Ticket) download links. UPTET 2018 Admit Card download link 1 for (Paper-1) Primary Level. UPTET 2018 Admit Card download link 2 for (Paper-2) Upper Primary Level. UPTET 2018 Admit Card download link 3 for (Paper-2) Upper Primary Level. UPTET 2018 Examination Important / Required documents in Examination Hall. UPTET 2018 Admit Card (UPTET Examination Hall Ticket) downloaded & printed from the official UPTET website. Download links for the respective UPTET levels (primary and upper primary) are given in the above section of this post. Photo Identity Proof (Photo ID Card) given / declared at the time of UPTET online registration. Please check your UPTET 2018 registration details for more information. Training Qualification Certificate with the original copy the mark sheet of any semester. Note: In case, if you don’t have the original copies of the mark sheets, copy of the mark sheet downloaded from the internet, attested by the registrar of the related institution will be acceptable. UPTET 2018 Important Instruction given in the Official UPTET Admit Card (Examination Hall Ticket). 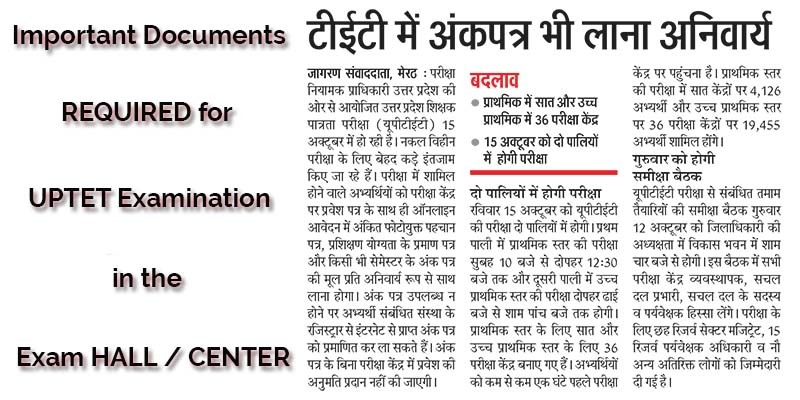 UPTET Important Instructions given in the Admit Card. Important: In case, the candidate is unable to provide any of the above document at the time of UPTET 2018 Examination at the Examination Center or Hall, we are sorry to inform that he / she will not allowed to participate in UPTET 2018 Examination. Best of luck for your UPTET Examination, we wish you will crack UPTET 2018 examination with a good mark score. Don’t forget to read all the important instructions carefully given in the last of the Official UPTET 2018 admit card.